I live in Woodbridge, VA, a suburb of Washington, DC, the capital of The United States of America. Most of my local and semi-local FM signals come from Washington (17 miles away), Fredericksburg, VA (27 miles), and Baltimore, MD (56 miles). Most tropo-enhanced FM signals come from Richmond, VA (78 miles), Salisbury, MD (90 mi), Norfolk, VA (139 miles), and Philadelphia, PA (144 miles). Tropo ducts to the south bring signals in from Raleigh, NC (214 miles) and coastal North Carolina a handful of times each year. 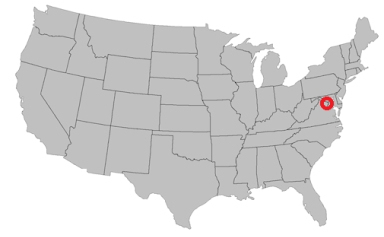 Signals to the northeast can be received once every so often from New York, NY (225 miles) and into Connecticut, Rhode Island, and the easternmost parts of Massachusetts, upward to 400 miles away in that direction. TV reception is very similar to FM here, albeit with slightly shorter distances after the 2009 DTV digital transition. AM Radio reception during the day is largely limited to signals within 60 miles away, largely only from Washington and Baltimore. Nighttime skywave reception brings in signals from up to 1000 miles on good nights, mostly from Ontario, Canada and Boston to the north, Chicago to the northwest, St. Louis to the west, and Atlanta to the southwest. Mountains 60 miles to the west, and ocean 116 miles to the east, greatly limit my effective tropo range to the point where I only get tropo-enhanced signals from the east and south beyond these distances; the sheer majority coming from the south and southeast. Sporadic E reception, thankfully, easily bounces over the mountains and I can get westward signals that way. 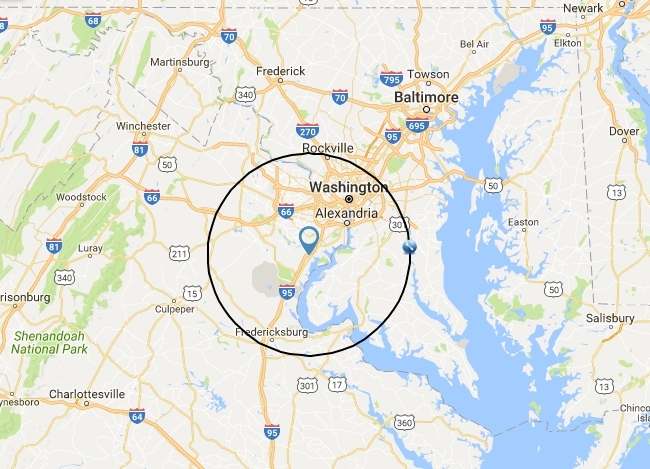 I consider all signals received within 30 miles from my home (anything received within the circle in the map to the left) to be eligible to be added to my DX Log. 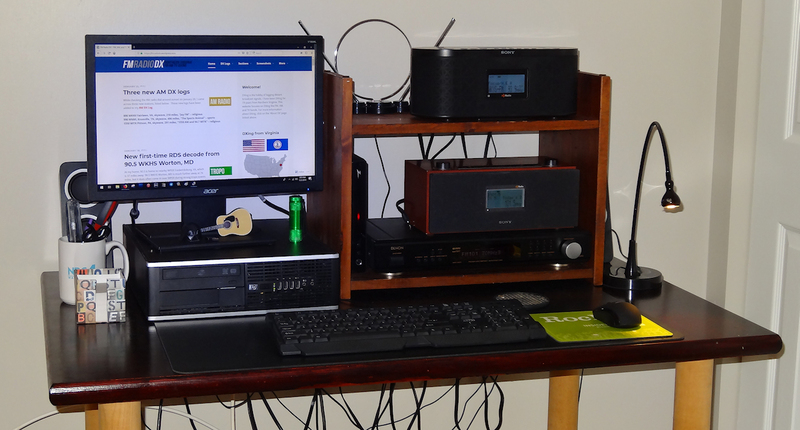 When I started DXing in 1999, I lived on the 2nd floor of a condo building high atop a hill in Woodbridge, VA, and I utilized indoor dipoles and rudimentary radios to DX. In 2002, I moved to a townhouse about a mile away, and although I was able to enjoy a rooftop antenna, my reception living at the bottom of a hill wasn’t a match to my pre-2002 days. In 2017, I ironically moved back to the same condo neighborhood that I lived in pre-2002, albeit into another condo building 200 feet away from my previous one. My new condo spans two floors of the building, most of it on the 3rd floor, with a small loft on the 4th (top) floor. Except for the area directly under the loft, the condo has sloping ceilings and minimal attics, providing interesting and differing reception conditions in all areas of the home. For my first two years, I operated out of two shacks, a main one in the 4th floor loft, and a smaller one in my 3rd floor office. 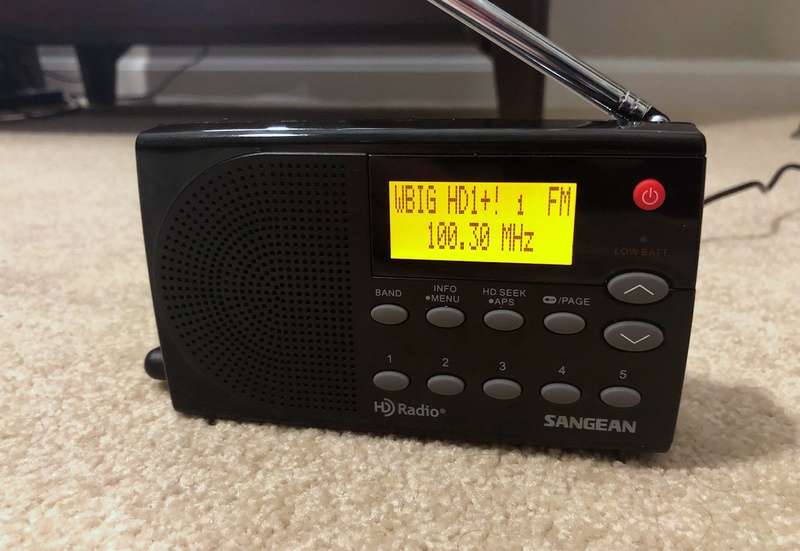 After purchasing the highly versatile Sangean HDR-14 in 2018, I decided to move my office radios to the main 4th floor shack. Above is a picture of my shack as of 1/21/19. My main radios are in an old TV/VCR organizer next to a computer, which is used for internet research during DX openings and also to power the Airspy R2 SDR radio. More information about each radio seen above is listed below. Living in a condo building provides a huge disadvantage when it comes to antennas. I can’t put an antenna on the roof since I don’t own it, and I don’t have access to the small attic above my shack. I had to improvise. 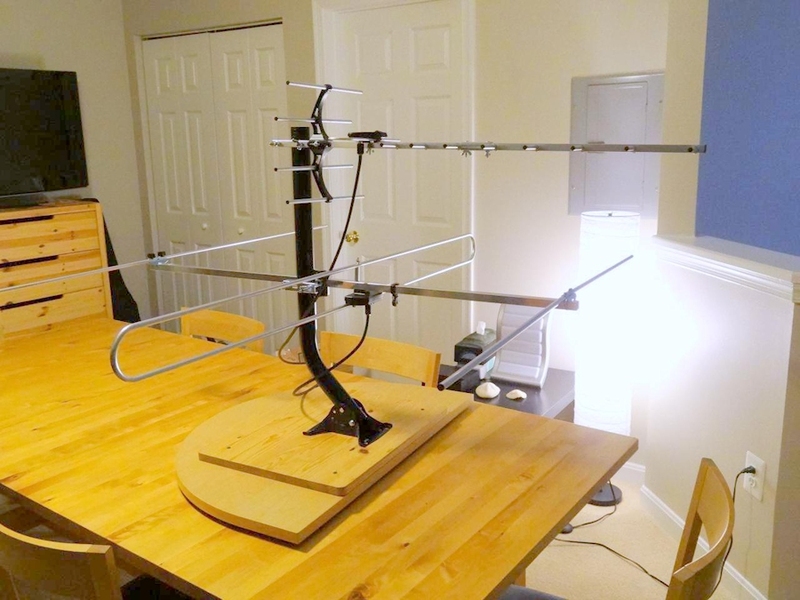 I used an old solid wood IKEA lazy Susan meant to turn heavy tube TVs and, with a second piece of wood for stability, attached a pole and mounted my two main antennas, the Britta Products V-30-H FM antenna, and the 1byone OUS00-0551 UHF antenna. The antenna is located immediately behind my main shack on a large table. When not in use, the antenna array moves close to the wall so it is not in the way. The setup works well. I can easily turn my antenna to zero in on weak signals simply by reaching behind me and turning the lazy Susan. Airspy R2 (2017-present). Read my review of this radio. The Airspy R2 is a software-defined radio that can record up to 10 MHz of FM at once. It also is highly sensitive and selective, rivaling the three Sony radios I own. It is quick to decode RDS and displays the PI code immediately upon an RDS lock. I actually own two of these radios–one located in each shack. Sony XDR-S10HDiP (2015-present). Read my review of this radio. Identical internally to the Sony XDR-F1HD, this radio is a little more rugged than the F1HD and has built-in speakers. This radio is used in my downstairs shack. Sony XDR-S3HD (2017-present). One of my latest additions, the S3HD is identical to both the S10HDiP and XDR-F1HD in terms of its selectivity and sensitivity. The only difference from the other two radios, instead of appearance, is that the S3HD has a headphone output, which makes it easy to hook up to my computer for unattended recording. This radio is used in my upstairs shack. Denon TU-1500RD (2006-present). This is a superb radio on par with the Sony XDR radios I possess in both selectivity and sensitivity. A friend modified this radio in 2006 to have 110 kHz filters in narrow mode, which greatly improves on reception. I replaced the tiny stock knob with a much larger knob from another stereo in 2007 to improve functionality. This radio is in my upstairs shack. Sangean HDR-14 (2018-present). Read my review of this radio. This is the latest addition to my shack, a superb portable radio that decodes RDS and HD Radio on both the FM and AM bands. This, along with the Airspy and Insignia NS-HD01, is one of the radios that I bring with me on trips. Insignia NS-HDRAD2 (2017-present). Read my review of this radio. This radio is a portable HD Radio and RDS-capable tuner that I have used on trips in the past. It isn’t as selective and sensitive as the Sony and Denon radios I possess, but it is a solid radio worthy of inclusion into my shack. Insignia NS-HD01 (2013-present). Read my review of this radio. The NS-HD01 is a portable HD Radio and RDS-capable tuner that I often take with me on trips accessible by plane, car, or train. Sony XDR-F1HD (2008-2017). Read my review of this radio. Arguably one of the best DXing radios ever produced in terms of sheer performance, this powerhouse radio served me well until early 2017, when it developed a deep hum and other issues with its audio output, rendering it useless. I plan on getting it fixed in the future, but for now this radio is shelved. 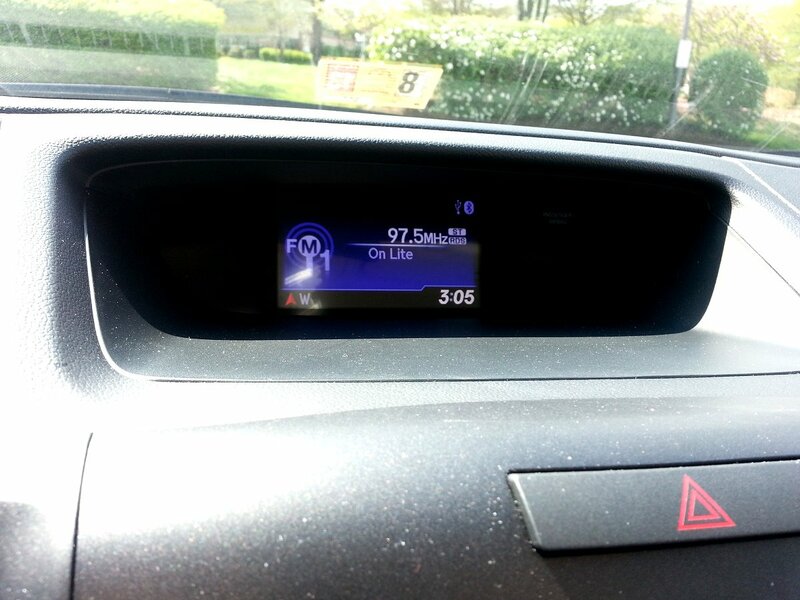 Thankfully, the radio is identical under the hood to two other radios I use: Sony XDR-S10HDiP and the Sony XDR-S3HD. Mitsubishi DA-F76 (2004-2006). I borrowed a family member’s DA-F76 tuner, unmodified, to use in the early 2000s. The radio experienced severe bleedthrough on many frequencies from local stations, which prompted my quest to find better radios. Philips/Magnavox AZ151817 (1999-2003). My first radio was a simple stereo boombox with its supplied whip antenna. The AZ151817 had phenomenal selectivity and sensitivity akin to the XDR-F1HD. The diagram above shows how everything is wired in my upstairs shack. My setup is split into three “prongs”: My main antenna, the Britta Products V-30-FM, is connected to the Airspy R2 and Sony XDR-S3HD at all times. When needed, I switch from a 2-way splitter to a 3-way splitter to include the Denon TU-1500RD. The Denon is not always connected to the setup because of the attenuation that a 3-way splitter puts in the signal line. The middle portion of the diagram above shows my Digital TV setup, which includes the 1byone OUS00-0551 UHF antenna. It is connected to my Zenith DTT-901 and the AV outputs of that is connected to my computer for screenshot taking. To take advantage of differing reception conditions that a dipole antenna has vs. a big Yagi antenna, my Sony XDR-S10HDiP is only connected to a simple pair of unamplified rabbit ears. With both Sony radios close by in my shack, I can quickly compare signal conditions between my antennas. I use the radio in my 2012 Honda CR-V, with RDS capabilities, for logging stations while out and about within 30 miles of my home. I consider myself to be a serious and ethical DXer. This is a personal hobby of mine that I partake in solely for my own satisfaction. In other words, everything you see on this website, and in my personal practice of the hobby, is accurate and true to the best of my abilities. I have no reason to do otherwise–I’m not trying to impress anyone here. I utilize the Worldwide TV-FM DX Association’s list of criteria for positively IDing FM and TV stations when practicing DX. I feel these rules are a good benchmark of what constitutes a positive log–the bedrock of DXing. I strongly believe that the DX community should be inclusive and welcoming to all, regardless of if the individual DXer is brand new, or well-established with a lifetime of experience. I feel that we all, equally, have something to offer to the hobby, as our experiences are all different. The human mind is always learning, and if we give everyone a chance, then we will all benefit.